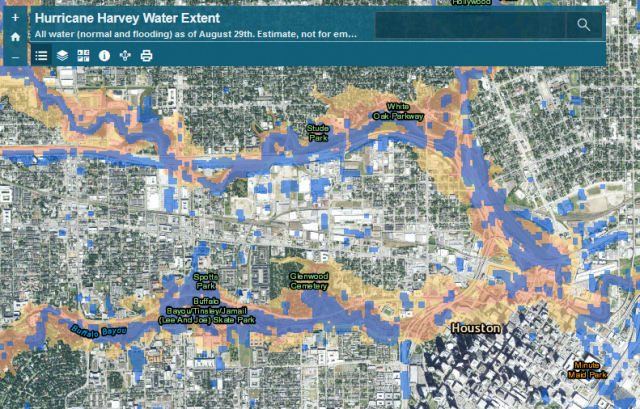 After Hurricane Harvey hit, the Natural Hazards Research Group wanted to assess the extent of the flooding as it related to mapped floodplains, as part of ongoing research into flood insurance and hazard mitigation nationwide to inform the National Flood Insurance Program (NFIP). To facilitate this analysis, I retrieved Sentinel 1 satellite radar data from before and after the storm, near peak flooding, and estimated surface water extent. This is often difficult since pavement has similar reflectance properties, but I talked with radar experts and read up on the process to better inform the analysis. I then published these data layers both for download and for exploration using ArcGIS server and a quick ArcGIS Online viewer. Our team then used this along with historical flood insurance claims information to write a blog post with more information and context, and helped the analysis to be picked up widely in national media. Copyright © 2019 Nick Santos. Powered by WordPress and Drop Shipping.